There is nothing better in football than derby day, not only for the fans of both teams but for anybody that enjoys the game of football and a high octane match. These matches tend to always bring a certain level of anger, despair and emotions to the table and by most part are well played affairs with a low scoring result. That seems to be the norm and also the expected outcome when you have two bitter rivals facing each other in a game that has more on the line than just three points. While most derby games have the low scoring as the norm, there are always those matches that break all rules and boundaries and become epic matches that will be remembered forever. These games tend to take a life of their own in the team’s folklore and for the losing side, time will not ever allow for that wound to heel. To me, these are the five most incredible derby performances. This is a very special derby with both teams playing there home games at the San Siro. During this match, Inter Milan was the home side, but it didn’t mean much as far as the result is concerned. The game went into the history books as the biggest margin of victory in the Milan derby. Before the match both teams had the same points in the standings, but AC Milan came in determined to break apart from their rivals and put an exclamation mark on their season. AC Milan dominated the match and completely destroyed Inter Milan, in a result that we will perhaps never see again. The feud between Mourinho and Wenger is not new, and during this incredible derby Mourinho was able to spoil Wenger’s party in a way that nobody will ever forget. Wenger was celebrating 1000th game in charge of Arsenal, and what went down on the field couldn’t have been a worst present. After only seven minutes of play, Chelsea already had a two goal lead and they never looked back. Kieran Gibbs saw a red card for a foul that Chamberlain had committed in what will be one of the most bizarre moments in Premier League history. Mourinho’s Chelsea had defeated Wenger in his 500th game in charge and 500 games more they would do it again. In 12 games that Mourinho has coached against Wenger he has never lost. This is an interesting stat to add to the developments that surrounded this great derby. More than the goals was the way in which Tottenham lost this game. The game started well for the Tottenham side that was looking at defeating their arch rivals in back-to-back league games. Two early goals from Saha and Adebayor gave Spurs the early lead and everything look set for a confortable win away from home against their hated rivals, but it wasn’t meant to be. Arsenal never quit and before halftime whistle the game was leveled at two’s. Rosicky gave Arsenal the lead and a quick brace from Theo Walcott put the game completely out of reach for Tottenham. A Scott Parker sent off did very little to help a complete distort Tottenham side, and what seemed to be at their reach at the start of the game was nothing more than a memory. Arsenal had control of the game and nothing was holding them back. The result could have been even more embarrassing for Tottenham, and that fact that it wasn’t is perhaps the only positive Tottenham fans will take from this match. No other derby match in Premier League history has seen more red cards than the Merseyside Derby. On the 21st minute of the match, Gerrard put his team ahead with a header. In a single play, Everton seems themselves go down one goal, and lose Lukaku due to injury. He collided with team mate Gareth Barry and had to be substituted. Sturridge scored two goals and Suarez added a fourth to put the game to rest. The result could have been larger, but Sturridge missed the opportunity to expand the lead and get his hat trick when he missed from the penalty spot. This was a game full of goals and emotion, what more to ask for from a derby. Of all the derby matches I have seen, this is perhaps the one that will always be etched in my mind as one of the greatest of all time. Perhaps it was because of the incredible lop sided scoreline, or maybe the Balotelli t-shirt, whatever it was I am not sure, but the dramatics, the goals and all that went on during that game made for one of the most if not the most derby match in Premier League history. 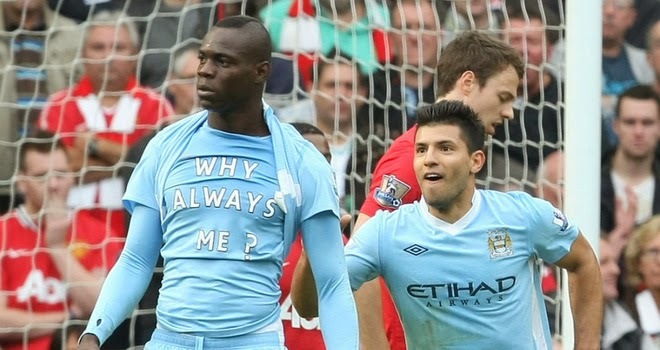 I will never forget the scoreline, but the “Why Always Me” t-shirt will hold a special place in my mind when it comes to everything that the game symbolized to the viewers at home or at the stadium. Balotelli, is who he is today, in large part for what he did on that day, and I don’t think any single player’s career has ever been so impacted by one derby match as Balotelli’s has. This was United’s worst home defeat since 1955 when they also lost to City. This was also the first time United conceded six goals in a game since 1930 matches against Huddersfield and Newcastle United.